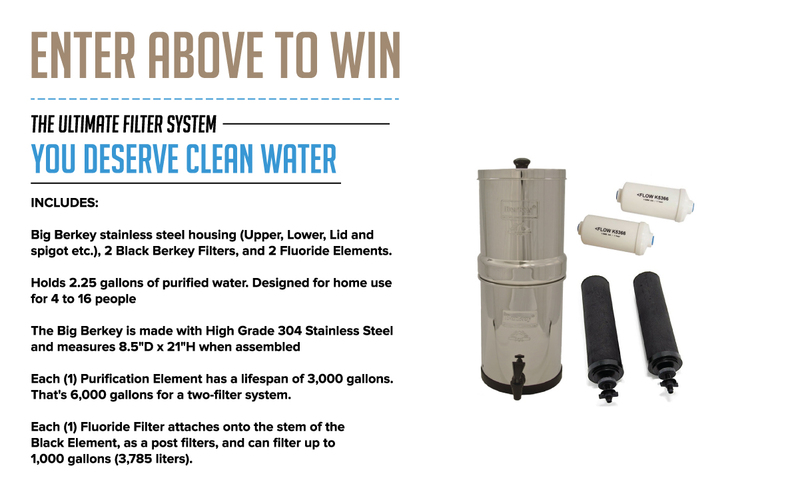 Win Your Own $290 Big Berkey Water Filter System! Get The Clean Drinking Water You Deserve! Void where prohibited and outside US. Open to [include eligible entrants, e.g., “legal US residents (incl. DC), who are 18+ (19+ in NE and AL; 21+ in MS) at entry”]. Begins [12:00:01 AM ET] on [9-9-16]; ends [11:59:59 PM ET] on [10-14-16]. To enter, To enter you can either fill out above form with name and email or you can send a postcard to 4330 gaines ranch loop austin tx, 78735. we will be awarding 3 prizes in total Total ARV of all prizes: $290. Odds of winning depend on number of entries received. For complete rules and eligibility requirements, http://sweepstakes.pioneersettler.com/rules/w7wik2on. Sponsor: [Pioneersettler] Copyright ©2016 [Pioneersettler]. [Pioneersettler]® and other logos or trademarks listed herein are trademarks of Company, Inc. in the U.S. and other countries. All rights reserved. This promotion is in no way sponsored, endorsed or administered by, or associated with Facebook, Twitter, LinkedIn, Pinterest or Google. You understand that you are providing your information to the owner of this contest and not to Facebook, Twitter, LinkedIn, Pinterest or Google.